Personalized art is an opportunity to honor a loved one, commemorate an occasion, or express your most highly held values. 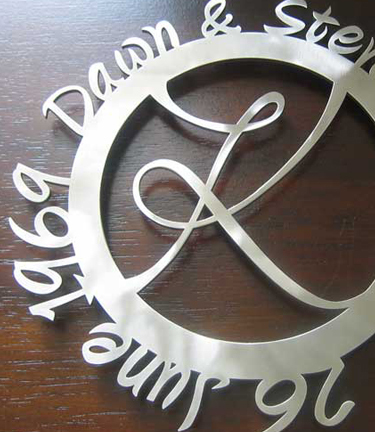 Designed expressly for you, a commissioned piece will illuminate your home or serve as an elegant and unique gift or presentation. We are happy to work with you to develop a design that feels just right. Please feel free to phone or email, and let us know what you are looking for. Together let’s begin to imagine the possibilities. A Commissioned Ketubah is uniquely designed to reflect your interests, values, and dreams in a most beautiful way. This is your chance to create a work of art of intense meaning, that will shine at your wedding and hang in your home forever. Our papercut ketubot can be simple or complex, traditional or modern. 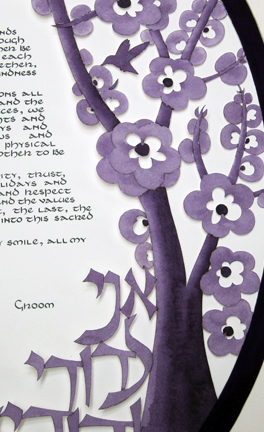 Let's work together to come up with a plan for your ketubah that feels just right to you. Please click here to visit a gallery of custom papercut ketubot. The intricacies of shape and shadow that come alive in a framed papercut are also so dynamic in a cut metal design for the wall. The space between paper and backing, or metal and wall, offers an evocative place for interactions of air and artwork. Please click here to see examples of custom wall art.